In large bowl, beat cake mix, water, peanut butter and eggs with electric mixer on low speed 30 seconds, then on medium speed 2 minutes, scraping bowl occasionally. Divide batter evenly among muffin cups. Bake 15 to 21 minutes or until toothpick inserted in center comes out clean and tops spring back when touched lightly in center. Cool in pans 10 minutes; remove from pans to cooling rack. Cool completely, about 30 minutes. Reserve 1/4 cup of the frosting. Spread remaining frosting over tops of cupcakes. 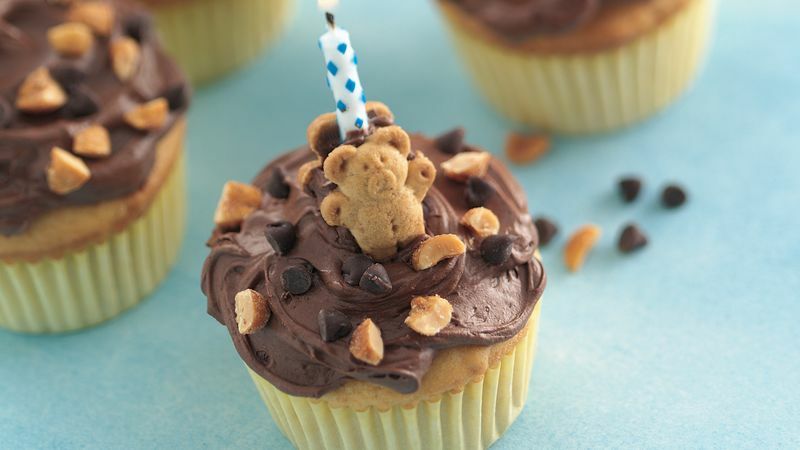 Sprinkle each cupcake with 1/2 teaspoon each chocolate chips and peanuts; press gently into frosting. Spread about 1/2 teaspoon reserved frosting on flat sides of 2 graham snacks. Place candle between frosted sides of graham snacks; press gently together. Repeat with remaining snacks, frosting and candles. Place on cupcakes, pressing candles slightly into cupcakes to hold in place. Store loosely covered. Instead of the teddy bear-shaped graham snacks, you can also use frosted animal crackers. Vary the look of these cute cupcakes by experimenting with different flavors of frosting. Instead of the chocolate chips and peanuts, try any of the small Betty Crocker® candy decorations sold with Betty Crocker® decorating icings in your supermarket. A collection of teddy bears on the center of the table and plates and cups with a teddy bear theme create the perfect setting for a teddy bear birthday celebration.